Piemonte, meaning foot of the mountian, is the largest region of the Italian mainland. Comprised mostly of mountains and rolling foothills, much of the land is too steep or cold for vines and so despite its size, Piemonte is not Italy’s leading producer of wine. However, if only fine wines are considered then it excels; more than 17 percent of all the DOC and DOCG wines are produced in Piemonte, more than any other region except for the Veneto. 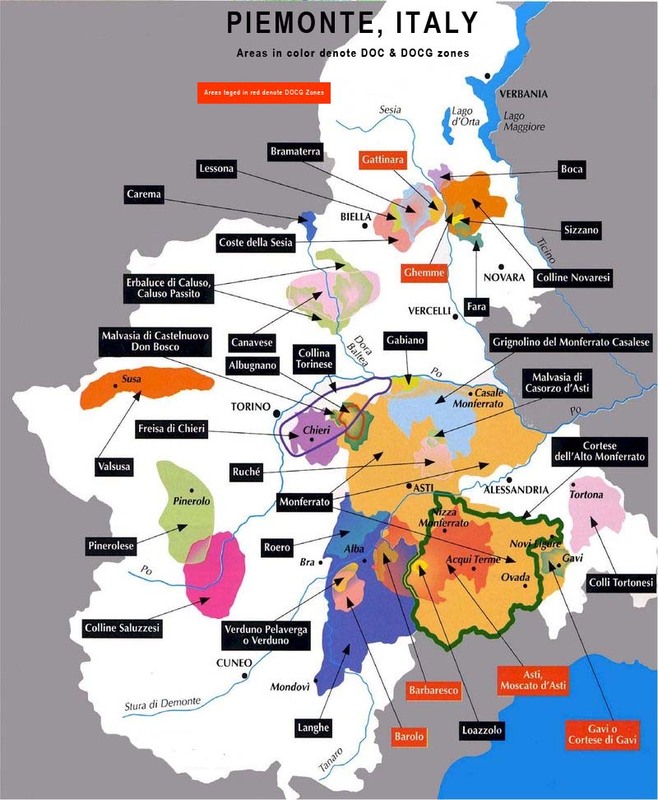 Although some of Piemonte’s wines are produced in the north, most of its best wines come from the vineyards further south, in the Langhe and Monferrato hills. The tiny villages of Barolo and Barbaresco lie about a dozen miles apart on either side of Alba. The soil around Alba is clay, limestone and sand. The best vineyards, most of which are planted with Nebbiolo are located on the domes of the hills that are tilted south, resulting in maximum exposure to the sun and hence ripeness. In Piedmontese dialect a “bricco” is the sun-catching crest of a hill and similarly a “sori'” is the south-facing part of a slope where in winter the snow melts first thus giving rise to wine names such as “Bricco Medica” and “Sori’ del Re.” The hills around Alba are planted with a good amount of barbera and dolcetto vines as well as the white varietal arneis. Piemonte’s most traditional white grape is however, moscato. The town forever linked with moscato is Asti and the resulting Moscato’d’Asti is a favorite refined low-alcohol sparkling wine. At the south-eastern edge of the Monferrato hills is the town of Gavi where the white grape cortese is the sourse of the dry, straightforward, traditional wine that bears the town’s name.